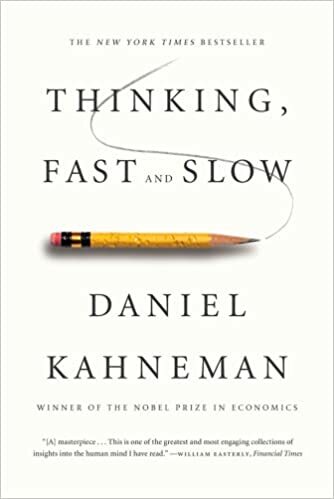 I decided to start reading Daniel Kahneman’s Thinking Fast and Slow after I saw it was referenced in When by Daniel Pink, and fellow educators were chatting about this book as well. It was a fairly long read, full of pretty exhaustive documentation, details and analyses. I’m glad I finished, though I could have done with a condensed version. This will be a short and sweet reflection with thoughts on how I can apply this to my teaching practice. Kahneman describes two systems for thinking, fast and slow, called System 1 and System 2. System 1 is our fast thinking brain and system 2 is our slow thinking brain. The book is about the biases of our intuitions and how we sometimes assume things automatically without having thought through them carefully. Kahneman calls those assumptions heuristics and goes on to describe in great details the way this plays out in our lives. The book analyses common situations we find ourselves in, the system often used to get there, and tries to determine if that was the appropriate system to use in that situation. We actually need both System 1 and System 2 thinking. For example, System 1 is good for thinking automatically, intuitively, involuntary, and effortlessly, when we drive, read facial expressions, or recall our passwords. System 2 is good for solving problems, reasoning, computing, focusing, concentrating, considering other data, and resisting the jumping to rash conclusions. Examples include, calculating a math problem, choosing investments, or filling out tax forms. These systems are in conflict. System 1 operates on assumptions that often are false so it can lead to less desirable outcomes. System 2 requires more work. It also requires recognizing and evaluating those assumptions, which is not as easy to do, so it is prone to error. The rest of the book is dedicated to examining myriad situations for the likely errors that would result by using either system. I think it is also about figuring out which system works best in which situations, which is different for different people, depending on your tolerance for error or gray areas. We’ve all had that student that blurts out the answer immediately to everything. They may even be very bright, but no matter what you try, they are a blurter. This book has given me a lot to think about in terms how to approach students like this and try to get them to think a little slower and engage System 2 thinking. You probably have had the opposite student as well. They overthink everything, are slow to make any decision, want to weigh every choice, for every situation, before even considering taking a side on something. Instead of treating these students like they are doing something wrong, we could do a better job of describing what they are doing. I might now say something like I see you’ve come to a quick answer. Fast thinking on your feet is an important skill to have, it’s good for X, Y and Z. Some cognitive scientists call this System 1. It’s good for these types of situations. There is also a System 2 style of thinking characterized by X, Y and Z which is good for these other situations. I’d love to see you practice some system 2 thinking. I’ll even give you a silent 2 fingers up sign if you get stuck in system 1 so you know to give system 2 a try as well. Something like that to frame it positively AND push them into an area that is less comfortable AND not condemn their over-reliance on one system or another. Both are good, both are needed, but different situations requires different systems. I’m also thinking about how I evaluate tools to use in regards to if it encourages one system over the other. For example, I used to love Kahoot, however, I really feel it encourages students to come up with an answer FAST. In fact, if you get the answer right, you get a certain amount of points, and if you get it right and are the first to respond, you get MORE points. That seems to rely on system 1 thinking, and chances are we have WAY more system 1 thinkers than system 2 thinkers. If you are like me, you struggle to find ways to help students become more reflective, slow down, and deliberate more, ie utilize system 2 more. I’m thinking that switching from Kahoot to Gimkit can tilt the classroom more towards system 2. While there is an element of speed to Gimkit, the faster you go, the more questions you get to answer, the more money you can earn, you can also answer questions over and over until you master all the content. There is less emphasis on speed and more on mastery learning. If you go slower, there is no punishment for that, whereas in Kahoot, each question has a time limit, so you can be robbed of the opportunity to learn if you take too long. If you go slower in Gimkit, you can take your time, think through, and over time, if you do the same assessment a few times, you can pick up the pace, once you’ve taken enough time, if that is what you need. The final area I noticed immediately was classroom management. Quite a few times this past year I had reminded students how to get help from their peers, online, in an app and then from me. I had students pass out the devices and within 30 seconds other students were out of their seats walking around the room. I often found myself quickly correcting that behavior and asking them to take their seat again. In some cases, not all, but enough times, they were seeking the help in the manner I had just described. I was using system 1 to evaluate their choices, whereas if I had slowed down a little, and watched what they were doing, I’d have known what they were up to, and I wouldn’t have had to say anything. While experienced teachers have often seen and heard almost everything, and can use system 1 effectively for many classroom management issues, it still pays off to use system 2 a little more. Overcorrecting, overscaffolding and micromanaging students rarely works out the way we want. Sometimes using system 2 and taking the long view will allow students to become the independent learners we desire. No matter what your reason for considering reading this book, I highly recommend it. Whether you are a teacher, admin, coach or not even in EDU, you will find something that resonates, just be prepared for a longer read. I don’t receive anything from these companies, however I just wanted to provide links here, instead of throughout the article.